We have a calling to reach out to all people and yet there are some who feel isolated, condemned and unwelcome in our churches. The LGBTQ teens have often been pushed aside and the stories of mental health issues, suicide, bullying etc. are never ending. As Church, we need to do something…our arguments are alienating people from the love of Christ and the fellowship of faith. 4 Views on Pastoring LGBTQ Teenagers is a book published by the Youth Cartel that wants youth workers/ministers/pastors etc. to rethink how we engage with youngsters on the margins who are often isolated and avoided by church. Whatever your theological positioning, the Church does not have a good track record and something has to change, or we will continue to abdicate our responsibility leaving vulnerable young people further condemned and judged. This book steps into a space to try and help those engaged in Christian youth ministry think through how they may be better equipped to honour those who find themselves in a place where a welcome is less than welcoming. The book takes a conversational style which includes testimony and practice from one practitioner and has a response from a second contributor. This is done remarkably well although it does not provide all the answers, nor attempt to provide a theological treatise, but rather seeks to begin conversations. It is not possible to join the conversation and not change practice. It is not possible to avoid being humbled by our own failings whilst engaging with our LGBTQ community – this has to be good news! Reading this book and joining the conversation has changed my own thinking and is nudging me towards being a better ambassador of Christ. The main contributors do a good job of seeking to share their perspective without forcing a personal agenda although that struggle comes through on occasion. Each viewpoint gives insight to the difficulties faced when pastoring LGBTQ youth and highlights the personal struggles that a pastor goes through when seeking to support the very people they are called to serve, especially when a church congregation holds a traditional conservative approach to sexuality. I would recommend the book because it opens up conversation – there were moments when I wanted to thank the contributor and give them a pat on the back and moments when I wanted to say, No Way! This for me, makes a good book. It is impossible not to tread on toes and there were a few moments when I wanted to challenge theological thinking but this does not take away from the importance of the contributions. Thank you to all involved for beginning this journey. I am looking forward to see how it will unfold. Some books leave you wanting more and this one is in that category. As a former youth pastor (and someone who still dabbles in youth ministry) and now as a parent of a teenager, I found that this book was extremely useful and practical in helping to understand a little more the complexities that a teenager faces in growing up. Marko is great at drawing you in to his thoughts and helping (with practical illustration) to demonstrate that this is not just theory but also been proven through experience. He uses his own family as a guide and this helps to ‘earth’ his thinking. The book sets out to achieve its goal of a ‘veneer’ of understanding which will require you to explore the ‘biological’ developments of the brain in greater detail. However, it is frustrating as it sets you on a journey, walks the first mile with you and then allows you to complete it alone…after a few days of frustration, you realise its brilliance, this is not a ‘how to’ manual but a thought provoker. This book has to be recommended – it is superb. The title is misleading, it is not just for parents, it is also helpful for anyone with an interest in teenagers. Top marks from me. The phrase “sitting in the stairwell” from Marko’s Youth Ministry 3.0 has sat with me for some time now. It is a challenge to find those places in which we can sit, ready to serve. Looking for those places has led me to think of those people that have ‘sat in the stairwell’ on my behalf, those people that have chosen to place themselves in a place of service, those who have given me time and space, those that have been as a friend. A few years back, I left a job that was special. It was one that had its challenges but the momentum was all forward and there were many positive results. There was the usual politics, but that goes for any role we have, and things were looking good for the future, despite various challenges on the table. However, during a long season where the politics, hurdles and personal things came together in an unnatural way, I chose to leave. My spiritual life was crumbling as the circumstances battered the fragile shell of mine – there was no alternative. No-one questioned my decision (to my face anyway) and I believed that there would be people to help me re-form my spiritual life as these were my friends. Unfortunately, it was not that easy and those I relied upon became too busy. I entered a wilderness, yet one man whose path crossed my own chose to ‘sit in my stairwell’. In the 18 months that followed he spoke few words, he spent little time with me, but he provided me with everything I needed. He welcomed me into his tribe, he engaged my family, let me know he was there, encouraged involvement at my own pace and demonstrated that he understood my struggles. During this time, spiritual life returned and balance of life returned. I owe him a great debt as he was willing to sit in a place that my friends did not – that type of thing cannot be bought. My friend has since moved on to new pastures but our paths crossed again the other week. It was a privilege to share with him in ministry and over lunch had an opportunity to thank him for sitting in my stairwell. My friend has mentored me – albeit in an unusual way – and now I am looking for the opportunities to do the same for others. 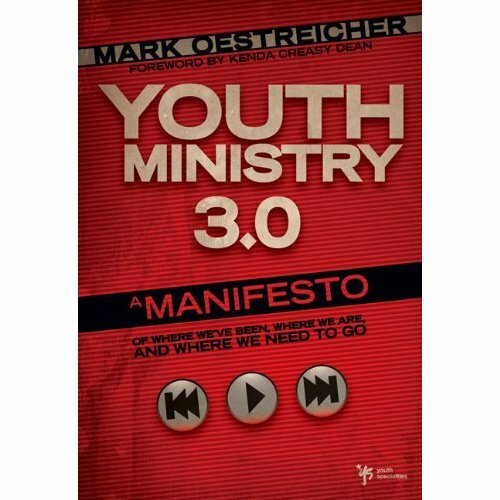 The last few days I have chosen to revisit Marko’s book Youth Ministry 3.0. It is an easy read but provides great food to fill up on and a challenge to move forward. If you have not read it yet, go buy it and sit in a coffee shop, it will be worthwhile. The discussions that were quite lively have died down a little and there is less ‘euphoria’ over what was written, maybe because we have settled back into our contentment as we recognise that some of our YM 2.0 ways still work and therefore the cost of moving ahead into new ways is too great a burden to bear. Here in the UK, the youth ministry scene is slightly dfifferent to the USA and it is my belief that we may be a little ahead of our friends from over the pond, however, the principles still stand. The book continues to deliver for me, even missed my stop on the tube as I was so engrossed again, therefore a second read was essential. So what reflections after a 2nd reading months later? For me the challenge is the timing. We are in transition between the YM 2.0 and YM 3.0 mindset and the culture we dwell in is also split. Yes, youth culture is ahead of the game, this is not news, but the way the world around us deals with such things is also divided. I believe youth culture adapts to this better than the adults do – but there are some young people who are themselves in the second era. Look at the difference in rural and urban settings, the young people are worlds apart in terms of culture, even in the UK! But that is the beauty of YM 3.0 – it covers both bases, it gives room to work and a freedom to try new things, fail sometimes, laugh and cry, as well as permission to break a mould that some of us may be trapped in. The challenge of adapting to the changing mindset will require sacrifice and time – my dream is that there will be plenty of us who are prepared to pay the price and give it the time. I, for one, am willing ‘to sit in the stairwell that leads to the youth culture underground‘ and play my part. Am trusting that others will sit with me and that we can support one another through this wonderful time in the history of God’s world. change is an interesting thing but today was shocked to read about the latest round of change in Youth Specialties. The statement on their website gives little clarity but I have to hope that these changes are for the best, yet somehow the news has given me a heavy heart. Hope those in the middle of it all, especially Marko, find hope and new direction on their journey. Big hugs to everyone of the heroes at YS.